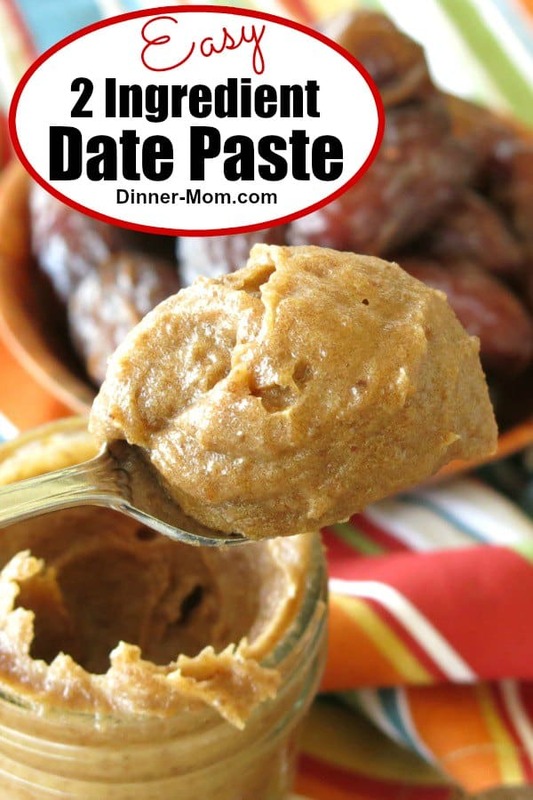 Once you learn how to make date paste with Medjool dates a whole new world of clean and healthy eating opens up. 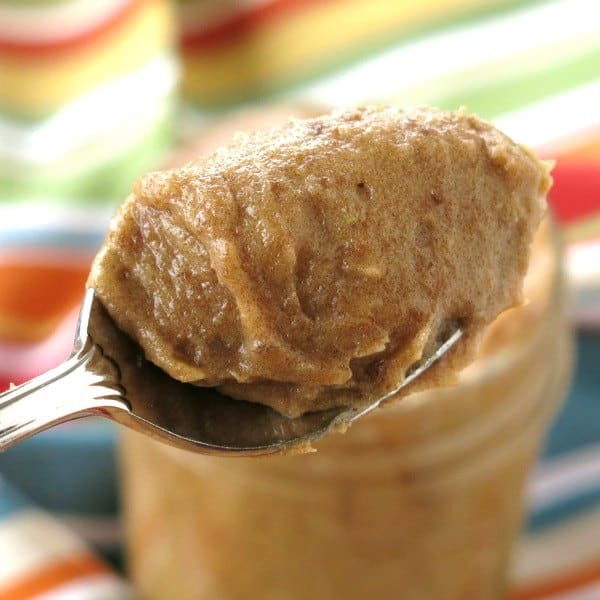 This 2 ingredient recipe is simple to make and will become your favorite healthy sweetener! We make Energy Balls with Medjool Dates all the time. Because we make this type of recipe a lot, we started processing Medjool dates in batches and storing the paste in jars so we could make recipes easily. Turns out it’s not just an all-natural sweetener for raw energy bites. It sweetens smoothies and coffee. It’s fantastic slathered on toast or muffins. Did I mention it works in baked goods too? We even use it to make Healthy Cream Cheese Frosting. Use it any time you need a little sweetness in a dish or recipe. Go ahead and enjoy it within reason! 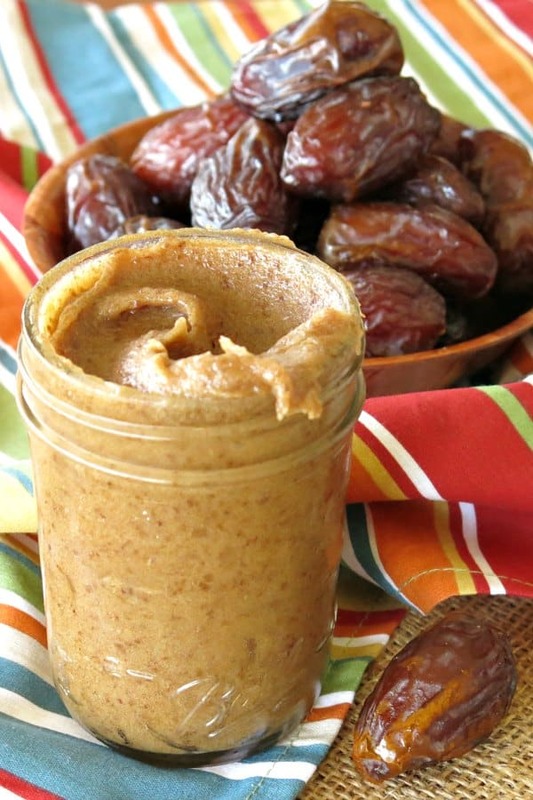 Date paste is high in fiber and other beneficial nutrients that you won’t find in granulated sugar. It’s also Whole 30 compliant, Paleo-friendly and vegan. Once you puree Medjool dates, you’re left with something magical. The finished product is smooth and creamy with a caramel-like taste that is an excellent substitute for SUGAR, honey and maple syrup. We are partial to Medjool dates which are thick, chewy and very sweet. We used this type of date in all of the pictures shown. However, the date paste process is the same for Deglet Noor dates, which are commonly found in grocery stores and can be less expensive too. 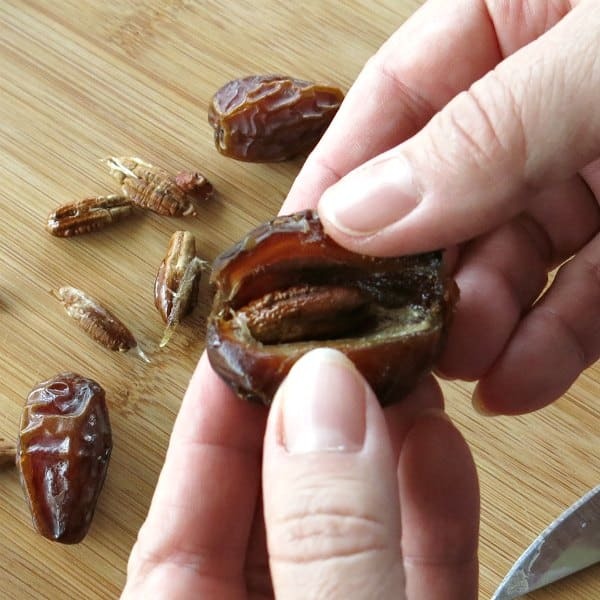 Still not sure why Medjool Dates are so great? Check out 10 Things You Need to Know About Medjool Dates by Eating Bird Food. You’ll find Medjool dates in the produce section because they are FRESH fruit! I’ve purchased dates with the pits already removed, but I’ll never pay a premium again. It’s so easy to remove the pits yourself. Cut a small slit on one side of the date. Open the slit and remove the pit. Your fingers get a little sticky, but the process literally takes a few minutes. 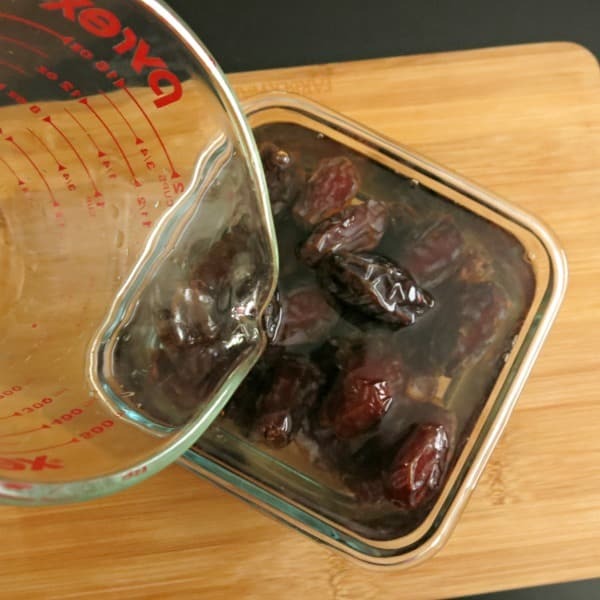 Soak dates in hot water to soften them. Note: Heat 2 cups of water in the microwave. Place Medjool dates in a glass or ceramic bowl and pour hot water over them. Cover and allow them to sit for 10-20 minutes. When you bring Medjool dates home from the store they’re soft, pliable and easy to process. The dates will begin to dry out during storage. They’re still delicious and processed the same way, but may benefit from soaking in hot water a little longer. Remove dates from water, reserving the water they soaked in. Place dates and a little of the reserved soaking water in a food processor. Note: Use 1/4 cup of water for 1 pound of dates. 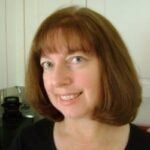 Use more or less water to achieve the desired consistency. If you want a chunky consistency, then 2 minutes might be enough. Process on high for at least 3 minutes and up to about 7 minutes. The longer you process the dates, the smoother and lighter in color the paste will become. The paste will become a little darker once refrigerated. That’s normal. 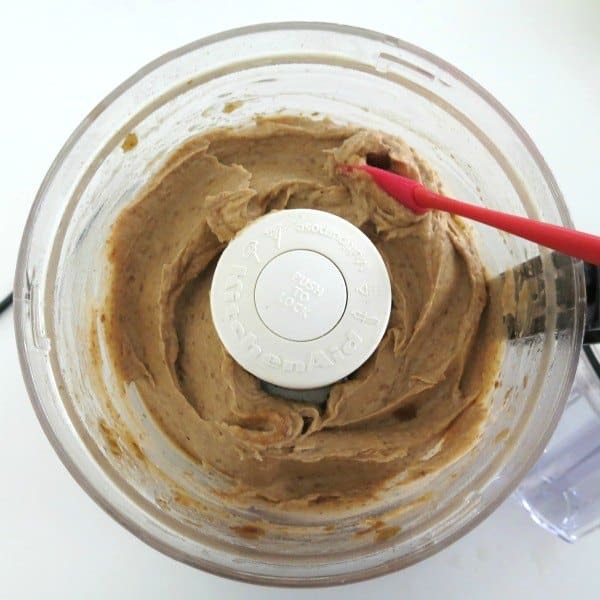 Note: A high-speed blender can be used instead of a food processor. Store date paste in an air-tight container in the refrigerator for up to 3 months. Date paste can also be stored in the freezer. If you go this route, we suggest storing it in small amounts, such as Tablespoon portions in an ice cube tray. Once frozen, remove the cubes and store them in a resealable bag. 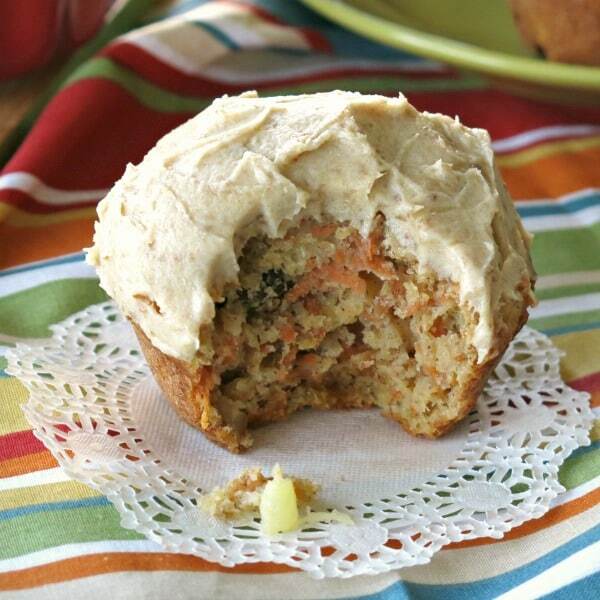 We even use date paste to make the cream cheese frosting on this healthy carrot cake muffin! 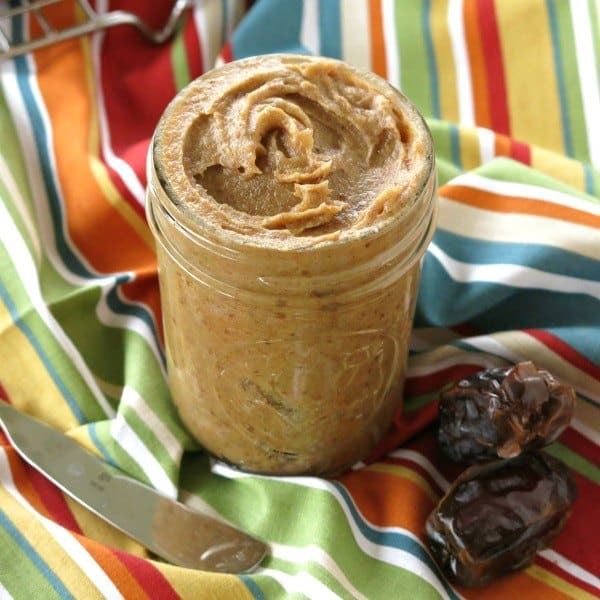 Do you have a favorite use for date paste? We’d love to add it to the list! Learn how to make date paste using Medjool or Deglet Noor dates. It will become your favorite healthy sweetener! Remove pits from dates if necessary by making a small slit on one side of the date. Open slit and pull out the pit. 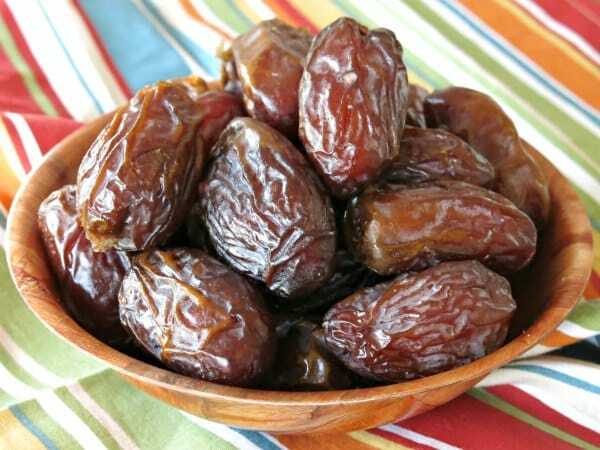 To soften dates, place them in a glass or ceramic bowl and cover with hot water. We heat 2 cups of water in the microwave for about 2 minutes. Allow dates to soften for 10-20 minutes. Newly purchased dates are usually soft and supple and will not require much more than 10 minutes. Remove dates from the bowl with a slotted spoon and place in a food processor. Add 1/4 cup of the water the dates soaked in. Process on high speed for 3-5 minutes, stopping and scraping the sides of the food processor as necessary. The exact amount of time depends on how smooth you would like the paste. Remove paste from the food processor to an air-tight container and store in the refrigerator for up to 3 months. I put this on a bagel this morning and it was SO GOOD. Thank you for the recipe! This was so easy to make and a perfect addition to so many recipes using sugar.